Thinking of You Card using the GORGEOUS Frosted Floral DSP!!! 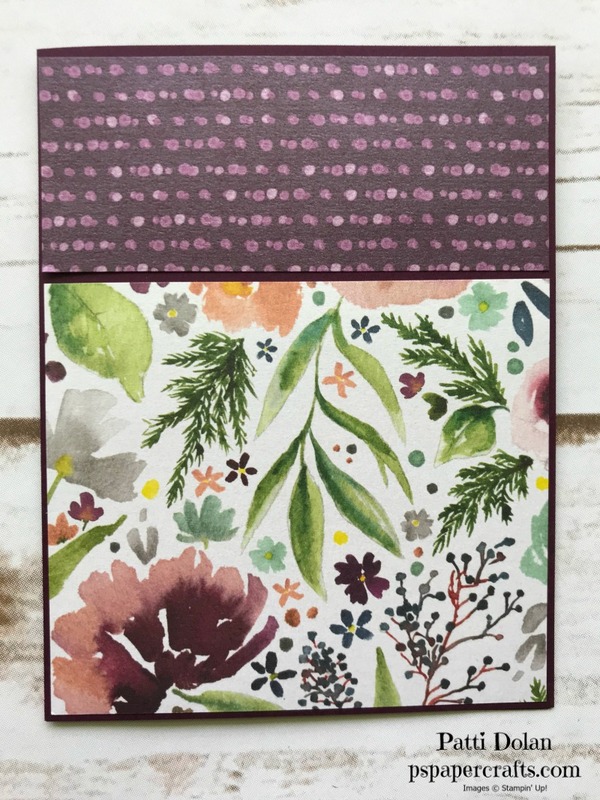 I have to say that I am just crazy over this new Frosted Floral Specialty Designer Series Paper. It is absolutely gorgeous! It has a shimmer to it and feels so nice. I don't think you can tell from the picture but check out my last post to see it on the video. The card base for this card is Blackberry Bliss which coordinates so well with the paper. I love that Stampin' Up! lists all the coordinating colors on the label of the DSP package. I cut a strip of Blackberry Bliss cardstock 4 1/8 x 3/4 and covered it with a piece of Whisper White Polka Dot Tulle Ribbon, adhering it to the back of the strip. The top piece of DSP is 4 1/8 x 1 3/4 and the bottom is 4 1/8 x 3 1/2. Just adhere them to the card base. Layer the strip over the DSP layer. I wanted a Thinking of You stamp and found one in the Thoughts & Prayers set but I didn't want to use the full sentiment. Post-It Note to the rescue. Cover the part you don't want with a Post-It Note and then ink it up. Be sure you remove the Post-It Note before stamping. It's so great that the Frosted Bouquet has some framelits for your sentiment and a layer to put behind it. Here's another look at the finished card. Newer PostProduct of the Week!! !